QuickDrop: Designed to attach directly to an exhibit supplied pipe and drape system QuickDrop™ is simply the fastest most convenient solution. 10 ft Graphic 109" x 88" 111" x 94"
Far too often the function the business owner plays in serving his or her customers, turns out to be the most important roll they can play. It's not acceptable to accept an order, pull it, and get it out the door via any of the automated means of distribution that we have access to today Many of our customers who approach us are needing advise on what products to choose and which ones will work best in the particular situation that they're in. Our goal at ShopForExhibits is to provide the direction necessary to our clients so their exhibiting experience will be as valuable as possible to both them and their company. Out of all the graphic suppliers in the trade show industry, Optima Graphics stands out when it comes to the skill they utilize in delivering products and services to their retailers. But how are they different? Above all else, they understand your needs as a customer and as a vendor partner, and when combined with a long range business plan, helps diminish the short term challenges. They work unceasingly to be the obvious supplier of choice in the trade show display marketplace, by cultivating the relationship, first and foremost. By carefully planning not only future product roll outs, and keeping distributors informed of current trends, has given Optima the capacity to make the relationship in the present, an enjoyable challenge. Years ago, it was Optimas' bold move into the Lambda printing technology which is used in photo murals for pop up displays, that really turned heads in the display industry. They've brought dozens of new display products to market like the 10 foot tall Multiscreen XL Banner Stand, and the Xpressions pop up displays just to name a few. 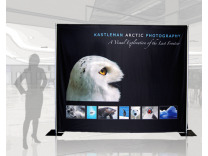 Optima has certainly had a positive impact on the products that flow into the exhibit market.